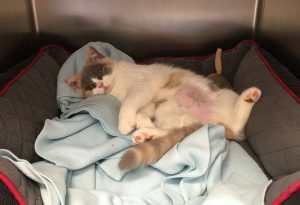 We are aware that placing a cat in a carrier and taking it to a strange place (like a trip to the vets) can be stressful for both cats and their owners. The Cat Friendly Clinic programme is a worldwide scheme set up by the International Society of Feline Medicine, and is designed to help address the unique needs and behaviours of cats in the clinic – reducing their stress levels and making trips to the vet easier for the whole family. Ark Vets has been accredited as an ISFM GOLD Cat Friendly Clinic. 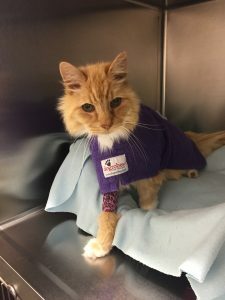 Reducing the stress of the visit encourages more frequent check, which allows earlier diagnosis and treatment of medical conditions and overall improvement in feline health. The Cat Friendly Clinic scheme is transforming the way in which cats are treated across the globe, and here at Ark Vets we want to do all we can to ensure the best outcome for our feline patients. We have a separate waiting area in the reception, where dogs noses will not sniff round your cats basket. And we have a special stand beside your chair that you can put your cat’s basket on, keeping it high up where cats feel safer. Our receptionists will provide you with a feliway scented cover for your basket to ensure your cat feels safe and secure while waiting for their appointment. We have special cat sized weighing scales and lots of other specialised equipment designed specifically for the individual needs of cats. 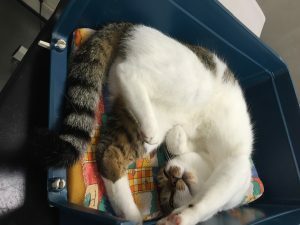 We have 2 separate cat wards well away from the dogs, where your cats can rest with night lights and white noise players to help them feel more settled. Overnight stays can be provided with scratching posts and toys to ensure they don’t get bored once they are feeling better. Our vets are all experienced cat owners as well as experienced vets, and are up to date on all the latest treatment options for cats. There are lots of things you can do at home to reduce stress even before your cat sets foot in the vets. Get them used to their carrier. Baskets should be strong, escape proof and allow easy access. You should ensure your cat does not feel exposed, so use a cover if it is a wire basket. Spray the basket with a pheromone like feliway to ensure if smells familiar and safe. There is more advice on bringing your cat to the vets in our cat advice leaflets. Hopefully this information will help you feel more confident about your visit with your cat, and continuing their treatment at home. Have a look at our practice tour, check out our facilities and come in and meet the team.